A filmmaker’s development happens gradually, over the course of a lifetime. His or her aesthetic is informed by a series of experiences, experiments, and ideas that coalesce through repeated trial and error. Once in a while, however, a singular event or experience can have such an impact that it can alter the course of a filmmaker’s development almost instantaneously. In the case of Stanley Kubrick, the events of the year 1960 proved to be such an experience. Everything he had done up to that point had suggested an artist who ultimately aspired to large-scale, conventional Hollywood epics—each of his first four features had eclipsed the other in scope and ambition, and his successful rendering of World War I trench combat and collaboration with superstar Kirk Douglas in 1957’s PATHS OF GLORY suggested that he had the chops to successfully take on a big, old-fashioned Hollywood epic. For all intents and purposes, he proved his bonafides and delivered a successful, Oscar-winning picture in the form of 1960’s SPARTACUS. The success of the film undoubtedly boosted Kubrick’s reputation and invaluably helped in solidifying the course of his career—but not in the way we might expect. The seed of SPARTACUS was planted when screen icon Kirk Douglas lost the title role to Charlton Heston in William Wyler’s BEN-HUR (1959). The blow to his ego compelled Douglas to set up his own project to rival Wyler’s, one that would focus on the classic tale of a slave revolt led by slave-turned-gladiator Spartacus. He would produce the film through his own production company and take the title role for his own. His choice for screenwriter proved highly controversial—blacklisted writer Dalton Trumbo, who by this point had been living in exile from the studio system after his outing as a Communist sympathizer during Joe McCarthy’s Red Scare hearings, sustaining himself by writing under a series of pseudonyms. Douglas hoped to deal a fatal blow to the integrity of the anti-Communist movement by allowing Trumbo to use his real name, proving himself every bit as virtuous and idealistic as the screen heroes he regularly portrayed. 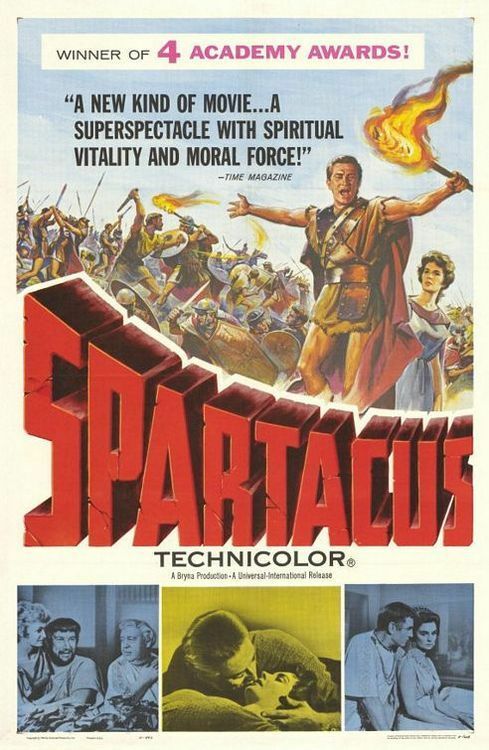 Trumbo and Douglas envisioned the biblical-era story of SPARTACUS as an allegory for modern-day concerns like the Civil Rights Movement and the McCarthy hearings (best epitomized during the film’s iconic “I Am Spartacus!” sequence), a tactic that undoubtedly gave the film some much-needed relevancy and immediacy. Director Anthony Mann was originally hired to direct SPARTACUS, but after a week of clashing with Douglas and the film’s considerable scale, he was unceremoniously fired. Douglas remembered the fruitful, if contentious, working relationship that he had with Stanley Kubrick during the production of PATHS OF GLORY, and so he called on the young auteur to step in and save the film. Kubrick’s subsequent realization of SPARTACUS is a peculiar albatross in his filmography, mainly because it is the only one that doesn’t feel like it bears his stamp. Admittedly, it doesn’t—for the first—and only— time in his career, Kubrick’s contract under Douglas severely limited his creative freedom and mandated the toning down of his aesthetic in favor of an old-school, Hollywood epic style. While the film is absolutely stunning from a technical standpoint, the result of Kubrick’s muzzling is a film that lacks genuine heart and soul. SPARTACUS is set in ancient Rome during the year 70 B.C. A proud, stubborn slave named Spartacus is taken from the salt mines of Libya and sold to Batiatus (Peter Ustinov), a well-known gladiatorial trainer who runs a prominent school outside the Roman capital. Forced into Batiatus’ fleet of burgeoning gladiators, Spartacus is disgusted by the idea of killing another man for the mere entertainment of others, but his talent for fighting and bravery is undeniable. His conviction and sense of morality makes him an admired figure amongst the other gladiators, and when a revolt unexpectedly flares up inside Batiatus’ compound, Spartacus becomes the slaves’ de facto leader, tasked with delivering them to freedom. Spartacus and his charges ride toward the sea, freeing the slaves along every town and accumulating a devoted army of their own. Simultaneously, he finds love and happiness with Varinia (Jean Simmons), a slave girl from the gladiator school. They take each other as man and wife, and begin dreaming of a world where their child will be born free. As word of Spartacus’ exploits reach the marble halls of the Roman Senate, a ruthlessly pragmatic politician named Crassus (Laurence Olivier) draws up plans to suppress Spartacus’ slave uprising before it ever begins. With his back to the sea and the Roman armies closing in on him from all sides, Spartacus will have to fight for not only his freedom, but for the freedom of his family and his people. At first glance, Douglas and Kubrick’s second consecutive collaboration appears to be even more fruitful than their last— Douglas’ towering performance as the proud, virtuous Spartacus is one of the best of his career, after all. However, their collaboration in SPARTACUS quickly fell prey to a collision of egos and stubbornness. Kubrick allegedly had a fundamental issue with the fact that the Spartacus character had no compelling faults or quirks, his ire further stoked by his complete lack of creative input on the script. Douglas’ impression of Kubrick’s artistic integrity took a substantial hit when Kubrick was quick to volunteer his name to replace Trumbo’s if the script were to run into trouble with the blacklist gatekeepers. This war of opinions between the two men festered throughout the long, arduous shoot, ultimately ruining their working relationship, if not their friendship, for good. Kubrick had no fear of spurning his collaborators for what he perceived as the greater good of the project, but in the case of Douglas—the man who had almost single-handedly turned Kubrick from a nobody into a major Hollywood director—perhaps Kubrick went too far. It’s a miracle that the film turned out as cohesive and confident as it did. Kubrick’s collaboration with the rest of the cast was not as dramatic, thankfully. Master thespian Laurence Olivier plays the primary antagonist, Crassus, with a cool, smoldering demeanor. In the infamous “snails or oysters” deleted scene, Crassus is revealed to be a bisexual—perhaps one of the earliest instances of such a character in cinematic history. Jean Simmons plays Spartacus’ love interest, Varinia, with a maternal, feminine air that’s perhaps a little too glamorous for a slave (but effective all the same). Rounding out the cast is Charles Laughton as the portly senator Gracchus, John Gavin as a young Julius Caesar, and Tony Curtis as Spartacus’ best male friend and fellow slave, Antoninus. Last but not least, there’s Peter Ustinov as Batiatus— the slave trainer and unexpected benefactor in Spartacus’ quest— whose sweaty, breathy performance earned him the Oscar for Best Supporting Actor. As it stands, Ustinov would be the only actor to win the gold statue for performing in a Kubrick film—a fact that must have incensed Douglas to no end judging by the ambition that compelled him to make the film in the first place. As befitting a grand Hollywood epic, SPARTACUS’ cinematography is sweeping and colorful. One might even mistake it for a David Lean film, which is ironic considering that Lean was initially approached to direct and turned down the opportunity. The cinematographer, Russell Metty, was already in place when Kubrick came aboard, and the two men clashed almost instantly. Reportedly, Metty was infuriated by Kubrick’s demanding pursuit of visual perfection and lack of regard for the cinematographer’s creative input. As a result, Kubrick personally shot most of the film himself, his brilliance with light and composition earning SPARTACUS an Oscar for Best Cinematography—ironically, it was Metty who took home the gold statue on awards night instead of Kubrick. Shooting for the first time in the anamorphic 2.35:1 aspect ratio, Kubrick (and Metty) use every available grain of the Technicolor 35mm frame to render a lush, expensive-looking image. Kubrick’s first feature in color employs a copious amount of sweep crane and dolly shots to sell the film’s scale, but it doesn’t contain the same kind of alluring energy that similar shots have in his other, more personal work. Indeed, the film appears to be the work of another director entirely. Many of Kubrick’s thematic explorations that have made his other works so rich and creatively potent are mostly discarded here in favor of a straightforward, un-ironic and earnest narrative. Like the short THE SEAFARERS (1953) before it, SPARTACUS sees Kubrick working mainly as a director for hire, with little control over the script or the production. The film’s violent aspects allow Kubrick to indulge in his visual meditations of man’s inhumanity to man in the form of fighting to the death for sporting and entertainment’s sake. Working solidly within the “swords and sandals” epic genre, Kubrick nonetheless manages to subvert it in the film’s climax, which sees Spartacus and Antoninus fighting to kill each other—not for the entertainment of others, however, but so as to save the other from an even-worse fate on the cross. SPARTACUS was a monster success when it released, easily becoming Universal’s biggest moneymaker in history until it was dethroned by 1970’s AIRPORT. It received widespread critical praise and won four Oscars, but more importantly, it made history when Trumbo’s employment effectively ended the Blacklist and prominent politicians (including President John F. Kennedy) disregarded the cries of anti-Communist protesters as they stepped inside the theatre. Despite the film’s success, Kubrick personally disowned the film (obviously to not as far a degree as he did with his first feature, FEAR AND DESIRE (1953)). However, SPARTACUS marks a crucial turning point in Kubrick’s development as an artist—whether he acknowledged it or not. Had he been happy with the final product and his overall shooting experience, Kubrick quite easily could have made a career of making supersized epics and become a David Lean-type for a new generation of filmmakers. Instead, his need for directorial control—a need that trumped cooperation or compromise—would lead him down a very different path. SPARTACUS marked the end of Kubrick’s “Old Hollywood” phase of conventional filmmaking techniques, with his disappointing experience on the film causing his attention to gaze towards the wave of experimental art films trickling out of Europe—films that would revolutionize Hollywood and place Kubrick himself at the cutting edge of an evolving art form. SPARTACUS is currently available on high definition Blu Ray via Universal.